WASHINGTON — President Donald Trump voiced confidence Monday that North Korea's leader would "honor" his commitment to denuclearize, despite Pyongyang's accusation that the U.S. is making "gangster-like" demands in negotiations. It was Trump's first public response since North Korea gave a harsh send-off to Secretary of State Mike Pompeo after he visited the authoritarian nation last week amid growing skepticism that the North intends to give up its nukes. Pompeo was seeking progress on the joint statement issued by Trump and Kim at their historic summit in Singapore in June. 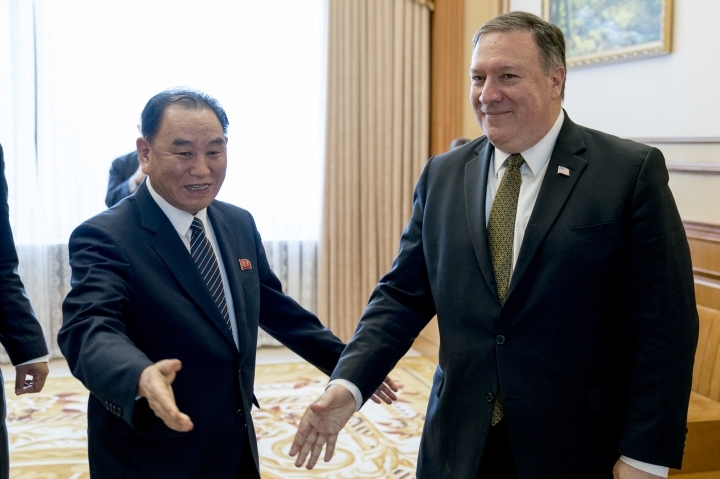 Pompeo characterized his talks with North Korean officials as productive, but the North's foreign ministry blasted the discussions, saying the visit — the third by the top U.S. diplomat since April — had been "regrettable." Trump responded to that setback with a tweet: "I have confidence that Kim Jong Un will honor the contract we signed &, even more importantly, our handshake. We agreed to the denuclearization of North Korea. China, on the other hand, may be exerting negative pressure on a deal because of our posture on Chinese Trade-Hope Not!" Robert Gallucci, who led the U.S in direct talks with North Korea beginning in mid-1993, said while the two statements contrasted he does not see Pyongyang's statement as "devastating in any way" to future talks. 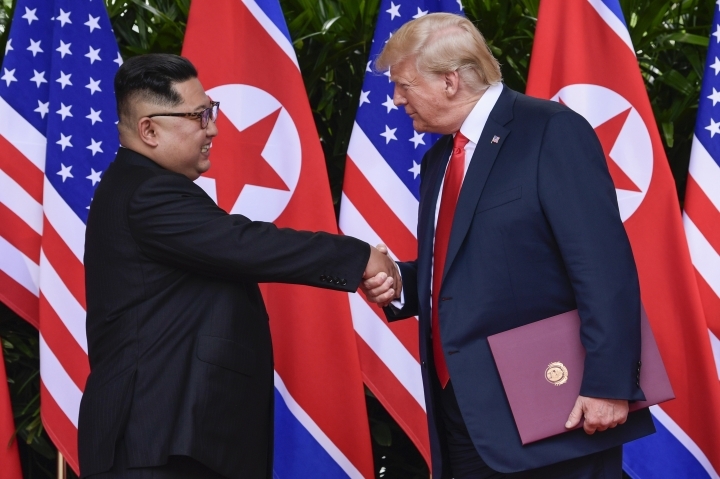 "The statement was to my ear — in a way — much more gentle and careful than I have heard from the North Koreans on any number of occasions over two decades," Gallucci said during a call with reporters organized by 38 North, a well-respected North Korea-watching website and project of the Stimson Center, a U.S. think tank. The U.S. and North Korea have actually yet to reach any agreement on the terms under which the North would relinquish its weapons programs, beyond the North's commitment at the summit "to work toward complete denuclearization of the Korean Peninsula." Pompeo's visit last week was intended to begin more detailed negotiations to flesh out the details. The president's comments on China appeared to reflect concern that U.S. imposition of punitive tariffs on Chinese imports last week could make China less cooperative in pressuring the North over its nuclear and missile programs. China is North Korea's traditional ally and main trading partner, and is key to maintaining sanctions on Pyongyang. That clearly remains a point of contention with North Korea. In its statement Saturday, the North envisaged "simultaneous" steps by the two sides and a declaration on ending the 1950-53 Korean War, for which a peace treaty was never signed. It recoiled at what it described as a "unilateral and gangster-like demand for denuclearization." Pompeo reported that the two sides had substantive discussions on next steps toward denuclearization and have set up working groups to hammer out details of an agreement. He said Monday it was "ludicrous" to expect results in a few hours of talks. "It's going to be a process. There's many hours left in negotiations," Pompeo said in response to a question from a coalition soldier during a visit to Afghanistan. In Washington, Senate Democratic leader Chuck Schumer of New York said the negotiations with North Korea have been a "flop" so far. He said there's a "disconnect" between Trump's rhetoric and what he's actually achieved to end the nuclear threat. Matthew Lee at Bagram Air Base, Afghanistan, and Susannah George in Washington contributed to this report.